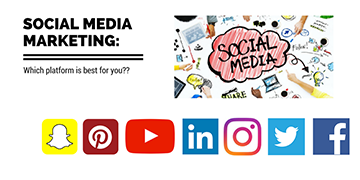 Social media marketing: which platform is best for your business? So, what’s stopping you from diving in and tapping into social media’s potential? Well, having a profitable social media strategy takes three precious commodities: time, cash and manpower. With so many platforms to choose from, and limited resources available, it’s vital that you plough your energies into the channel(s) that will provide the best ROI for your business. Don’t worry, this article is here to help. The big 6 social channels each have distinctive personalities and procedures that, if you want to do well, you need to be aware of and plan for. Do you want to know how to succeed on social? Read on, then. At the end of this article, you’ll have the knowledge of which platform you need to focus on to kickstart your marketing efforts. 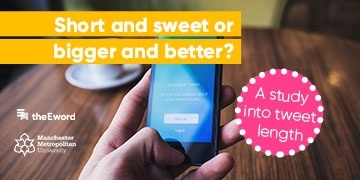 Also, check out our Digital Cupid Guide that explores what would happen if brands and social media hooked up via speed dating. Facebook is by far the largest channel in terms of size. The platform boasts more than 1.65 billion active monthly users, users who tend to spend more time here than on any other social platform. Although there are signs that younger users are moving to newer platforms, Facebook is still very much top dog, with around 82% of 18-29 year olds using facebook more than any other social medium. What’s more, no other platform can get anywhere near Facebook’s demographic diversity. Everyone and their nan (quite literally) uses Facebook. Facebook is great for building brand loyalty and brand reputation. Don’t use the channel to sell; keep it conversational and compelling, and place building a bond with your customer base paramount to everything else. Tip: Share anecdotes and personal stories, and ask questions in order to build engagement with your audience. Look to post around twice a day. Facebook’s wealth of data is a goldmine for marketers. Rather than paying to promote your content blindly, get the most from your marketing budget by serving your content only to those who most want, need or would be interested in hearing of your services. Having a winning Facebook strategy will build brand awareness but can be very time-consuming and may not necessarily bring in the largest amount of leads for your business. This fast-paced platform prides itself on it’s brevity, immediacy and its ability to connect people. Twitter has over 750 million members who, between them, generate 175 million tweets daily. As users are limited to just 140 characters, the information shared tends to be a company’s latest update, a contribution to the day’s relevant topics or a leading snippet that’s purpose is to link back to a larger content offering housed off Twitter. Twitter is universally popular and is used by individuals, businesses and organisations alike. The largest demographic is young adults (18-29), and the female-male split is fairly equal. Share your latest news and content in a manner that’s enticing enough for people to click the link, read the article, then retweet it to their network. To make your tweets stand out from the rest, you need to think of each tweet as an attention-grabbing headline for the link contained within it – try incorporating quotes, stats, photos, GIFs, or polls, and watch your engagement figures soar. Outside of driving traffic to your site, Twitter is also a great way of reaching out to influencers, journalists or other brands or organisations within your niche. Top fact: 67% of Twitter users are more likely to buy from a brand they follow on Twitter. Look to tweet around 4 times per day (minimum), and even more during events pertinent to or involving your company. By using ‘hashtags’, you can make your tweet visible to a wider audience than just those who follow you. Research what hashtags matter to the audience you’re trying to reach out to, and include them in your tweets. Likewise, if you have content that’s relevant to a trending hashtag, share it whilst the topic is hot to get more eyes on your work. Due to the frenetic nature of the channel, a tweet has a short lifespan unless it goes viral – around 18 minutes, on average. That’s why big players such as Buzzfeed aren’t afraid of reposting the same content again and again in reworded tweets, because they know this will drive maximum traffic to their site. LinkedIn is the only social network that’s specifically geared towards the business community. In years gone by, LinkedIn was little more than a way for job-seekers to connect with recruiters, but the channel has come into its own of late. If you work in a B2B environment, you simply need to utilise LinkedIn. With more than 450 million members, many of whom are influencers in their organisations, this channel is a real lead-gen hotbed. LinkedIn users tend to be evenly spread through the age brackets of 18 to 65, and are likely to have some form of higher education. If you want to reach an organisation’s decision-makers, LinkedIn is the right place to go. It boasts 61 million senior-level professionals, 40 million decision-makers, and 6 million C-suite execs. Want to know how to create content that will resonate with LinkedIn users and create leads? Well, reading this article is a must. In short, content that will drive leads. If you produce work that will help potential customers to become better at their jobs, you’ll be on the right track. Yes, LinkedIn might be for professionals, but sticking to stiff company updates won’t be doing you many favours. Just because it’s geared towards businesses, that does not mean you have to be impersonal. True, people don’t expect to see cat videos or night-out pics – but you're still free to inject some personality into your posts. On top of lead-gen, LinkedIn also allows you to showcase your company’s ethos and what it’s like to work there. Doing this well is a great way to recruit top talent. You should aim to post about 3-4 times a week. Like Facebook, LinkedIn’s data allows you to serve ads or content to your exact audience by allowing you to target people by industry sector or job title. It’s also a good idea to join and participate in LinkedIn groups, because this is a great way of building relationships with your potential clientele. There are a few things to consider with LinkedIn. No other network links employees and employers more intimately. Therefore, should an employee act inappropriately on the channel, there may be knock-on implications for your business. LinkedIn tends to share your actions with other users. This is worth keeping in mind. If you want to snoop on a lead, a potential employee or a competitor, you might want to make sure you log out first. If you are working in a lifestyle industry (fashion, food, design, travel, DIY, etc. ), then Pinterest could become your best friend. See the platform as the user’s online scrapbook – one they use for inspiration, ideas and tips when they are in the research stage of the buying journeys. This means that if the content you provide matches the topic Pinterest users are searching for, you stand a good chance of them purchasing from you. Pinterest is extremely visual. To succeed, you need to have high-quality, striking images that link back to your products or site. Get this right and Pinterest can drive a huge amount of highly relevant traffic to you. Best practice is to collect your ‘pins’ in relevant ‘boards’ – boards that people can find and follow depending on their needs and tastes. On a pin-by-pin basis, you should also make sure the captions on your pins are optimised so that they can be found by Pinterest’s highly-sophisticated search system. Pinterest is mainly made up of women – in fact, a massive 80% of its users are female. The average user is between 18 and 35, and the largest demographic (42%) is women in that age bracket. As mentioned, Pinterest is all about great images. If you work in an industry such as interior design or travel and leisure, fork out on top-notch photography in order to fully grab your user’s attention. If not, use the services of a designer who can bring your pins to life. Look to pin multiple times a day. Whilst it’s important to post content that links back to your site, the best Pinterest users also curate pins from influencers in their niches onto relevant boards. On Pinterest, it pays to share the love. A profitable tactic is to use influencer marketing. Build a relationship with a Pinterest influencer (what you may call a ‘Pinfluencer’) in your niche and encourage (or pay them) to repin your pins. The results of this will be your pins going viral across newsfeeds – with that will come increased visibility, traffic and ultimately sales. Pinterest is great if you’re in a visual industry. Even if you’re not, it can still serve a purpose as long as you create visual imagery to support the blogs that you’ve written. Below are a few examples of how you can do this, and all these images were knocked up fairly quickly using the design app Canva. Snapchat is the platform of choice for millennials. If you’ve ever wondered what a group of teens are laughing at on their phones, odds are it's Snapchat. Snapchat started with one premise: the snaps posted would ‘destruct’ after viewing. That has changed a little – because each piece of content lasts a little longer today – but Snapchat is still all about ephemeral content and living in the moment. To resonate on the platform, you need content that’s snappy, informal, punchy, humorous and engaging. What’s more, it needs to BE CREATIVE. Snapchat has 100 million daily users who share 7 billion videos between them daily. 45% of users are between 13 and 24, whilst only 17% are over 45. Looking to speak to a young audience? Using Snapchat is a no brainer. You want to look to create content that tells a story, shows off what goes on behind-the-scenes at your brand, or helps you to announce a big exclusive. Remember: with Snapchat you only get a few seconds to make an impression. Be funny, be bold, be creative, and let users see behind-the-curtain. If you have an announcement to make, drop the big news here. There’s no set time to post with Snapchat. Just make sure that when you do, it’s gonna grab people’s attention. If you want users to engage with your brand, test out Snapchat filters. These filters allow users to take pictures over pre-designed filters and then share them with their friends. As a brand, you can design the filters they use – doing so is a great way of driving up engagement and reach figures, and is also a useful tactic for promoting an event with user-generated content. For more information, check out this blog on the amazing benefits of using Snapchat Filters as a brand. 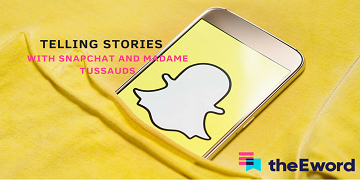 If you aren’t promoting an event or trying to sell to a young audience, Snapchat is simply not the channel for you. It can also prove difficult and time-consuming to create the compelling videos needed to succeed on the platform. For many people, Instagram is now the default platform for a bit of downtime. Whilst it’s super-visual like Pinterest, it distinguishes itself by being less about researching fashion or holidays and more about dropping out and seeing the fun things that the friends, celebrities and brands you follow have been up to. As Instagram photos are uploaded and edited straight from a user’s smartphone, this platform is more about visuals than words. That being said, if you create or jump on relevant hashtags in your captions, you’ll see your posts reach much wider audiences than just your followers. Instagram has more than 500 million members, 59% of which check the app on a daily basis. More than half of the user-base is aged between 18-29, whilst 25% are 30-49. Visuals that are bold are the reason Instagram exists. Create and share awesome imagery, or instead show candid behind-the-scenes stuff, and you’ll be an Instagram hit. Remember: people go to Instagram to chill, so just make sure you aren’t being too salesy. Instead, try to create a strategy that’ll let you build your brand via Instagram. If you work in luxury, food, fashion personality or lifestyle, you need to be on Instagram. Even if you’re not, you can still use it effectively by promoting your work, your employees and your working culture. One post a day should be fine on this channel. Instagram is a great place to directly interact with your fan base. You’ll find that hosting contests and giveaways will really drive up engagement. Also, make use of the integrated sharing features for Facebook and Twitter. Doing so will allow you a quick and easy way to repurpose your content for other channels whilst also promoting your Instagram presence. Although Instagram is amazing for brand-building and engagement, with no clickable links allowed anywhere other than within your bio, driving people from the app to your site can be a challenge. That being said, third-party platforms such as Link My Photos have appeared, and these let you link to your posts from within your bio. Regardless, Instagram is great for brand-building, but if it's a sea of traffic you’re after, you might be swimming in the wrong ocean. Get ready for the most over-quoted fact in digital marketing. As well as being a video-sharing platform, YouTube is also the world’s second-largest search engine. If your company’s work lends itself well to sharing informative videos (how-to guides, webinars, employees discussing industry topics, etc. ), you should really consider developing a strong YouTube strategy. Like Facebook, it seems that everyone and their dogs are on the channel. The trick is making videos that resonate with or help your target demographic. As mentioned, brands that do well on YouTube use the medium to educate their target demographic. In today’s fast-paced world, time is precious. Therefore, you want to create short (90-second) videos that inform or excite. If your content is longer than 90 seconds, consider chunking bigger content ideas into a digestible mini-series for enhanced results. If possible, posting once or twice a week is brilliant. If not, just post as and when you can. In 2006, Google bought and took over YouTube. Since then, the search giant has given priority to YouTube videos in its search results. That means you need to know the keywords that’ll work best for your videos in order to optimise them and thereby gain maximum views and traffic for your site. Tip: Many people digest video content in situations such as on their commute or in front of their telly. By captioning your videos, you still ensure viewers can enjoy your content with no sound rather than having to click away from the content you’ve painstakingly created. On YouTube, production values are key. Whilst modern video-editing software allows you to make top-quality videos through an iPhone, if you get this wrong and produce a video with shaky camerawork or poor sound, it will reflect negatively on your brand. We hope that this guide has given you some insight into which platform(s) might work best for your business. As you can see, there are many ways to go, and ultimately it’s all about finding out which one will give you the best ROI. 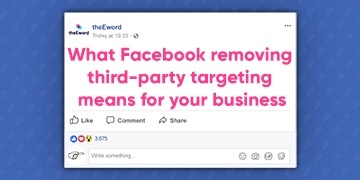 Here at theEword, we come up with the strategies you need to speak to your target audiences, and then we carry these strategies out in detailed campaigns. If you would like a free consultation to talk over ideas that will help you hit your KPIs, contact our team today.